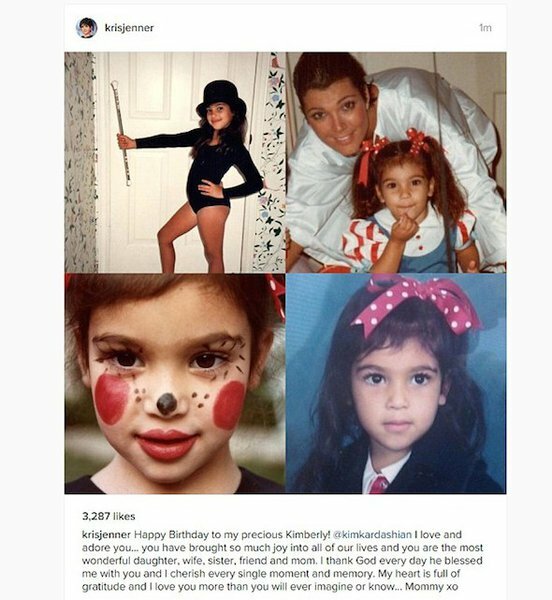 On 21 October, the mother of Kim Kardashian has posted the baby photos of American TV star on her Instagram page which conquered the users of the Network. Kris Jenner revealed these photos of her daughter on the occasion of the birthday of the last, who turned 36 years old. Under the photos from Kim Kardashian’s childhood, her mother wrote a touching greeting for her daughter. The relatives of Kim and her fans joined to the warm words. By the photos of Kardashian that were stored in the family album, it is clear that at an early age, Kim loved to dress up. As it turned out, since the girl was young she really wanted to gain the popularity and fame and she successed indeed. In the comments and congratulations to the photo, the followers of Kim Kardashian suggested that the celebrity spent her birthday with her family at home, because after the robbery she almost never leaves home because of the nervous shock, from which she is still recovering today.